New Delhi: When Gurinder Singh, who runs a factory that makes small steel parts for farm tractors and cranes, applied to state-run Indian Overseas Bank (IOB) last month for a Rs20 lakh overdraft to import new machinery, he was turned down for the first time. “We usually enjoy overdrafts of between Rs15 and Rs20 lakh during the festival season. It has been cut to zero this year," says the 37-year-old entrepreneur, who had to borrow from friends to even pay the 80-odd employees of his Faridabad, Haryana-based firm, KP Tools Ltd, their annual Diwali bonus. Singh’s Rs6 crore unit and other small companies, mainly family-run entities or joint pr-oprietorships, are reeling under a credit crunch as banks hold back loans for fear of default. The credit squeeze cuts across all sectors of the economy, but small and medium enterprises (SMEs) that lack the deep pockets, endurance power, credit worthiness and alternative funding sources of big business, have been hardest hit by banks’ reluctance to lend and the high cost of money. 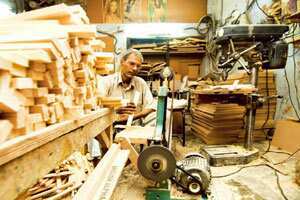 SMEs account for nearly half of India’s manufacturing output and 40% of its exports. The sector provides livelihood to 45 million employees, according to data from the ministry of micro, small and medium enterprises. “The first sector to be hit when there is a credit problem is the small and medium sector," says a spokesperson for the Confederation of Indian Industry (CII). The industry lobby has asked the Reserve Bank of India (RBI) to reduce risk weights for SMEs that would help them access bank credit more easily and suggested that the central bank and the government create a corpus to lend them money at rates charged on loans to banks’ best borrowers, says the CII spokesperson. Banks downplay the credit squeeze, which RBI has been trying to loosen by reducing the amount of money lenders have to keep in reserve. In Faridabad, for instance, there are 37 banks operating. IOB’s Faridabad branch manager Sunil Kumar Bhatnagar says, “Customer requirements are catered to within the norms. It’s actually the market sentiment which is being echoed by the public." The lead bank for the area is Syndicate Bank. The lender’s lead district manager Narayan Singh Vimal says, “There is plenty of liquidity and banks are lending." About 18% of total advances are channelled to SMEs, he adds. In its latest move to loosen credit, RBI had on 1 November cut the proportion of deposits lenders must keep with the central bank to 5.5% from 6.5%. It had also reduced the amount banks are required to invest in government bonds by one percentage point to 24% and pared its policy rate to 7.5% from 8%. But benefits of RBI’s policy actions haven’t yet started trickling down to SMEs, small business owners say. Several firms are turning to chit funds, some of them unauthorized, to raise finance, according to at least two entrepreneurs, who didn’t want to be named. Others, such as Singh, are turning to friends and relatives. Two recent surveys on small companies highlight their difficulties. A report released by Kadence Research India says a survey of SMEs showed that only 40% of 300 respondents could secure funds when needed. A snap poll conducted by CII showed 66% of 150 respondents citing high interest rates and banks’ reluctance to lend among the impediments to their growth. “There is an undeclared credit freeze. Everything is on hold," says Anil Bhardwaj, secretary general of the Federation of Indian Micro and Small and Medium Enterprises (Fisme). Banks insist they aren’t slowing lending to SMEs. “There is no such problem. We have not received any complaints," says R.V. Singh, a credit manager at Punjab National Bank (PNB). Lending to small-scale industry falls under the so-called priority sector and entrepreneurs are allowed to borrow up to Rs50 lakh without collateral under current government guidelines. But Fisme’s Bhardwaj says banks rarely fulfil this commitment. “A small guy will be lucky to get more than Rs3 lakh against collateral," he adds. Growth in gross bank credit to the small-scale sector has halved between 1996 and 2007 to 6.34% from 12.66%, according to RBI data. “Banks are taking steps; they have promised to abide by the guidelines under priority sector lending," says Dinesh Rai, secretary of the ministry of micro, small and medium enterprises. The CII survey showed that 78% of the respondents used private equity as the major source of funding, while 21% say they depended on venture capital financing. Only 13% say they sought loans under the government’s credit guarantee scheme, aimed at helping small companies get bank credit without collateral or third-party guarantees. “But a majority of small industries do not have access to venture capital or private equity funding," says Ramesh Datla, chief executive officer of Hyderabad-based laboratory instrument making company Elico Ltd.
“Our view is that if the current situation persists, employment will go down," says Datla, who also heads CII’s National SME Forum. CII has suggested easing rules relating to foreign direct investment (FDI) in SMEs, which is effectively capped at 24%. An SME would lose its status as a small or medium enterprise if FDI exceeds 24%. CII has also suggested setting up a special stock exchange for the sector to raise between $1 million (Rs4.77 crore) and $10 million by selling shares to the public. Banks, CII claims, have been reluctant to lend to small-scale units partly because the government currently provides insurance for only 80% of the loan amount. Entrepreneurs say the lack of capital has put their expansion plans at risk. Naveen Jain’s company, Dayachand Engineering Industries Pvt. Ltd, welds electrodes and wires for the steel fabrication industry. It employs 25 people at his factory in Muzaffarnagar in Uttar Pradesh and posted a turnover of Rs3.5 crore last year. A week ago, Jain was told by PNB, his longtime lender, that providing him Rs1 crore to fund his expansion would be difficult. “Unless we expand, we cannot sustain ourselves and stand on our feet," says Jain. In the words of Singh, the Faridabad-based entrepreneur who had already pledged factory assets to borrow Rs80 lakh, the situation is a “nightmare".